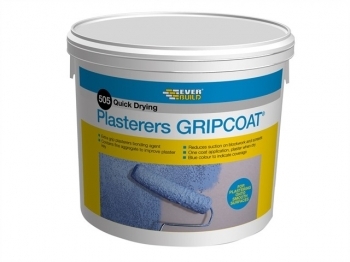 Plasterers Gripcoat is a high performance, plasterers grip coat bonding agent specifically designed to provide an improved key to smooth surfaces. Containing a fine aggregate, it provides a mechanical key to backgrounds such as plaster, concrete, painted surfaces, textured surfaces and ceramix tiles. One coat application, coloured blue to indicate coverage.